From left: Naji Khoury and Orlando Báez speak during a news conference Thursday. As part of its social responsibility campaign, and in an effort to create connections and protect the island’s student community, Liberty Puerto Rico announced the availability of a video produced by the company along with the U.S. Immigration & Customs Enforcement’s (ICE) Child Exploitation Investigative Unit. 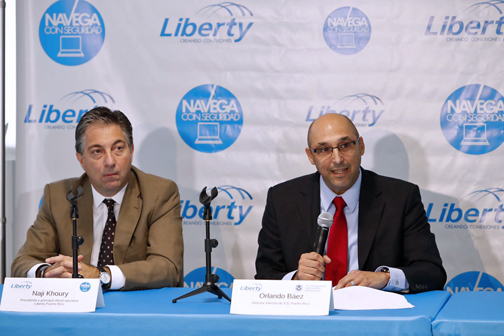 To achieve a larger dissemination of the video, Liberty also announced a partnership with the Puerto Rico Department of Education, through which the company will facilitate training and materials on cyberbullying for teachers in the School Health Division — which offer health classes for students in 6th to 12th grade — and who will require the courses as a graduation requirement for students. The division will also use the video for its “Navigating the internet Safely” program, which has specialized teachers and each one will train 10 students who will carry the message to their peers. Meanwhile, the School Retention Attention Unit, which works with high-risk schools and develops a plan to work with bullying and cyberbullying, will also use the video. This division has social workers, professional counselors and psychologists that work as an integrated team. “One of our main goals is to take care of children in every aspect. The education of Puerto Rico’s boys and girls is essential for all of us at the Department of Education, as well as their physical and emotional health,” Education Secretary Julia Keleher said. “That’s why we support this project, which I am sure will instruct and help students on a very important issue that could affect them significantly,” she said. Liberty will be working on a similar partnership with the island’s private schools, company officials said Thursday. The video will be available for schools and the public in a downloadable format in the “Navega con seguridad” section at Liberty’s webpage, and in the company’s YouTube channel. It will also air on channel 85 on Liberty’s digital standard definition lineup (channel 285 on its high definition lineup) from Aug. 24-30 at 7 p.m., 8 p.m. and 9 p.m. The video will also be broadcast on CableVisión (channel 10 on its digital standard definition lineup and channel 210 on its high definition lineup) from Aug. 25-30 at 8 a.m., 9 a.m., 8 p.m. and 9 p.m. The video educates audiences on the risks of cyberbullying and sexual exploitation to which children and teens are exposed to when navigating the internet without supervision and how they can protect themselves. Special Agents Alek Pacheco and Reinaldo Medina, from ICE, generated a discussion on this subject, providing information and tips for children and teens ages 9 to 14. It is divided in six chapters that last between 5 and 14 minutes. Subjects discussed in the video include cybercrimes, internet safety, cyberbullying, statistics, sexting and iGuardians. “We developed this video to help educate parents, students, teachers and the public on this important subject and make navigating the internet a safer and trusted experience,” said Naji Khoury, president of Liberty Puerto Rico. “As internet providers on the island, we are aware that this is one of the most powerful tools ever invented, but what matters is how it is used. This video is a valuable tool for the public and private education systems and for parents, to help avoid cyberbullying and child exploitation,” he said. Cyberbullying and online child exploitation have become highly important subjects for the island’s school community, particularly due to the skyrocketing number of sexual predators who use the internet to lure their victims. “To protect the most vulnerable sector of our population — our children — from sexual predators on the internet is everyone’s responsibility, from the public to the private sector. Partnerships such as the one ICE has forged with Liberty to educate this this population should serve as an example of how it is possible to work together for one purpose,” said Orlando Báez, ICE’s interim director. “At ICE, we’re very aware of the fact that we can’t win this battle by ourselves and that only through education and by joining forces we will be able to keep our children safe on the internet,” he said. “As a telecommunications company, Liberty is in an ideal position to take our prevention and education message to a great number of children and through this video, the company has become a multiplying force of our efforts, making them theirs as well,” Báez added. The “Navega con seguridad” campaign began in 2013 and its main purpose is to educate the public on how to use the internet responsibly and safely. For more information on “Navigating the internet Safely,” visit Liberty’s webpage. Hey Buddy!, I found this information for you: "Liberty Puerto Rico, ICE partner on cyberbullying video". Here is the website link: https://newsismybusiness.com/liberty-partner-cyberbullying/. Thank you.